When you get out of your vehicle to admire the scenery don't stand on an anthill! Make sure the camp stoves and lanterns are in working order before leaving. Pack lots of mosquito repellent! 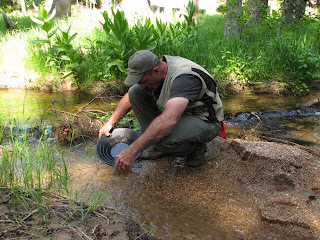 We did find time to do some relaxing things like pan for gold, ride the four wheeler trails and watch the abundant wildlife. And the night sky was absolutely spectacular!! I had forgotten how many stars you can see when you get far enough away from civilizations lights. I took two cameras with to capture the flora and fauna and was rewarded with some great shots of the wildlife. I also took with my sketch book hoping to find a quiet moment to sit and sketch, something I haven't done in many, many years. At least, not field sketching. The voracious mosquitoes didn't allow for much of that though. Even though I had on repellent they were bound and determined to bite me on any exposed spot they could find! Mostly they tried for my eyes and ears....very annoying when you're trying to sketch! I did find this baby robin clinging to a small shrub in some tall grass. His parents were busy collecting food for him all day. 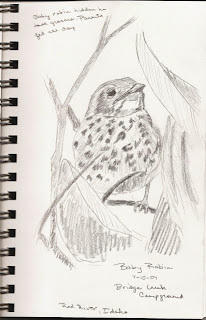 I was able to get several photos of him and managed to get a sketch done as he was sitting very quietly and hardly moved. I watched him all day until it got dark. In the morning he was gone and my hope was that he found the strength and courage to fly to a safer spot. 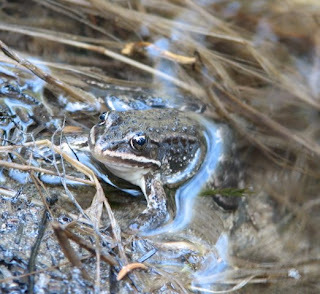 I was also able to get a photo of this frog that sat in a little pool where my husband was panning for gold. He seemed perfectly content to share his space with Brian and allowed me several pictures. It wasn't until I tried to catch him that he dove and swam away. I think I've identified him as a Columbian Spotted Frog. I'm planning on trying to do some more field sketching this week just around the area where I live. If mosquitoes don't carry me off or ants aren't attacking me I'll try to get some of the sketches posted! Here it is.....the finished portrait! I am very pleased with the way this turned out. I decided to leave the background unfinished so the focus is all on the dogs. I thought it might get too busy with four dogs and all the coat patterns and opted for the simplest solution. This will look awesome with a gunmetal gray mat and black frame that compliments the graphite color. It will have a very classic look. I have emailed an image to my client and will be anxious to get her reaction, but thought I'd share it here first. Well, this commission was the last one I have on my books at the present time, but that's okay. I have been waiting for a little break so that I can take some time for a creative sabbatical. It's not that I won't be working on some art work of some sort, it's just that now I get to play a little. I have been making notes to myself about some new ideas for months and now I will finally get a chance to try a few of those out. So.....keep checking back to see what's new as I will be posting the new stuff here! Almost done! As you can see a lot of progress has been made since my last post. I am on the final dog and with any luck should have it all complete by the end of the week. 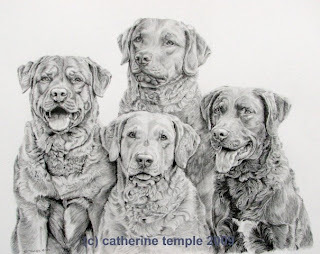 I have been concentrating primarily on each dog individually first. 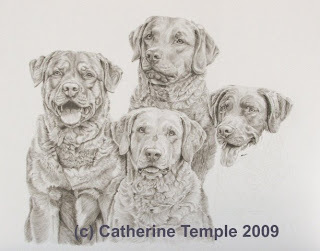 After I have them all in I will go over the whole drawing and make adjustments to values so that each dogs image will stand on it's own and not completely blend in to the next one. As I said before, there are actually three different colors of Chesapeakes represented here and I want to try and capture that. I will also be deciding whether to include a hint of a background with these four. 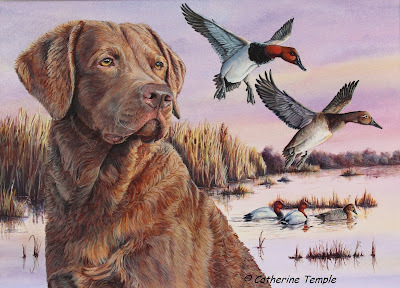 The photos were taken outside near a pond and Chessies are definitely water dogs. These dogs, however, are not used for hunting so that type of background will not work. These dogs are primarily show dogs and much loved companions. My client has left the design up to me so I will have to give that some thought. Sometimes the best design is the simplest. 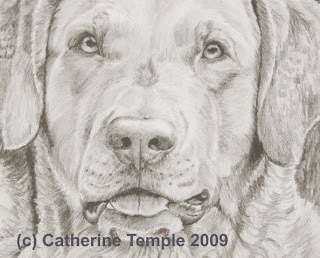 This image shows a close up of one of the dogs. I wanted to show some of the pencil strokes and shading. Unfortunately, it doesn't show the finer detail as well as I'd like it to, but it does give some indication. Chessies have a very wavy coat pattern and it can go in several different directions at once. There are curls and waves and ridges that are created as the hair goes different ways. On some areas it looks like someone has brushed the hair in the wrong direction, against the grain so to speak. This makes it very challenging to draw and sometimes it requires me to turn my work all around in order to properly draw the contours. I often work on a piece upside down because on difficult patterns it allows you to draw the actual pattern instead of the way you "think" it should be. I also wanted to show a closeup of the eyes. No matter what else you do this part has to be right on. This is the heart, soul and personality of "this" dog and if I can't capture that it's of no value to my client. The eyes are by far my favorite part and I spend a lot of time around this area working to get it right. I could be quite happy zooming in and cropping paintings this tight all the time. I can look in this dogs face and see love and intensity and wisdom and maybe just a bit of longing to go do something fun! Anyway, it's time to get back to work. Sometimes it's hard to finish a piece especially one that you really enjoyed doing and if it turned out really well it's hard to let it go. I have really enjoyed this one. I hope my client will be as pleased with it as I am.